Monin Pistachio (Pistache in French) syrup in a stylish 70cl glass bottle. Pistachio nuts have a delicate, subtle taste that is wonderful either for eating as it is or for flavouring both sweet and savoury dishes. One of the most popular uses of pistachios is pistachio ice cream. Monin Pistachio makes it easy to enjoy the authentic indulgent flavour of pistachio in speciality coffee beverages and cocktails. Taste: Nose of roasted almonds, powder almond aftertaste, pleasant, sweet pistachio flavour which will remind you of your favourite pistachio ice cream. Applications: Cocoas, coffees, milkshakes, dessert drinks. Pistachio goes very well with white chocolate. Sugar, water, flavouring, emulsifier: acacia gum, colouring agents: caramel E150b, E104, E131. Contains pistachio and hazelnut extracts. Please note - E104 may have an adverse affect on activity and attention in children. 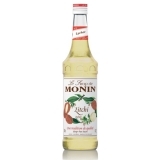 Sorry - We are out of stock of Monin Syrup - Pistachio (70cl).